For super-soft and silky skin that feels hydrated all day long, you'll be hard pushed to beat this shea body butter. 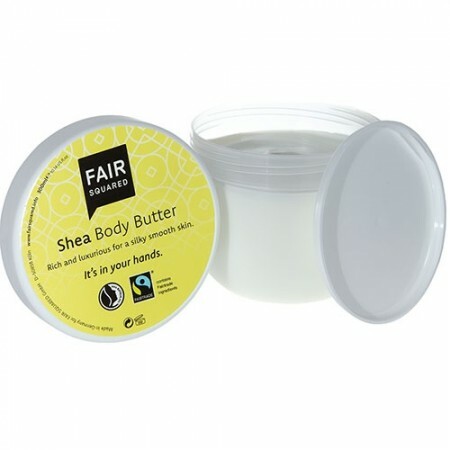 Made with Fairtrade olive oil from Palestine and Fairtrade shea butter from Burkina Faso in western Africa, this rich body butter is not only a top treat for your skin but will help to support communities as they work towards building sustainable futures. Bring together two of nature's wonder products, olive oil and shea butter, this body butter is packed with natural vitamins, minerals, essential fatty acids and antioxidants. Olive oil and shea butter have been used for centuries to naturally hydrate and heal damaged skin and a little bit of this wonderfully rich body butter goes a long way. Rub a small amount into your skin after showering and enjoy the feeling of intensely moisturised skin for the rest of the day. This body butter is free from SLS, parabens, phtalates and PEGs. It is vegan registered, and Fairtrade and Natrue certified. Made in Germany using: Aqua, Glycerylstearate SE, Olea Europaea Oil (Olive Oil*), Cetearyl Alcohol, Vitis Vinifera Seed Oil, Glycerin, Butyrospermum Parkii Butter (Shea Butter*), Camellia Sinensis Leaf Water (Green Tea*), Xanthan Gum, Sodium Benzoate, Potassium Sorbate, Parfum, Tocopherol, Citric Acid, Citral, D-Limonene. If you want eco, ethical and fabulous body products, Fair Squared have it covered. Set up by ethical entrepreneurs, Fair Squared aims to provide fairly traded, organic alternatives to the bodycare products currently available on supermarket shelves. Their Fairtrade cosmetic and hygiene products are made in Germany using ethically sourced ingredients, providing fair and sustainable employment to communities across the world. None of their products have been tested on animals and many carry the Vegan Society’s Natrue logo.